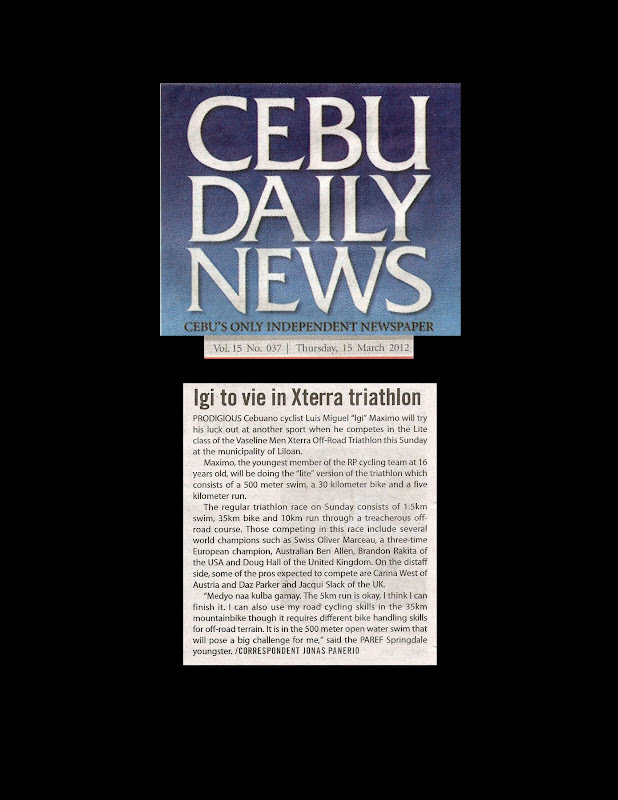 PRODIGIOUS Cebuano cyclist Luis Miguel "Igi" Maximo will try his luck out at another sport when he competes in the Lite class of the Vaseline Men Xterra Off-Road Triathlon this Sunday at the municipality of Liloan. Maximo, the youngest member of the RP cycling team at 16 years old, will be doing the "lite" version of the triathlon which consists of a 500 meter swim, a 30 kilometer bike and a five kilometer run. The regular triathlon race on Sunday consists of a 1.5km swim, 35km bike and 10km run through a treacherous off-road course. Those competing in this race include several world champions such as Swiss Oliver Marceau, a three-time European champion, Australian Ben Allen, Brandon Rakita of the USA and Doug Hall of the United Kingdom. On the distaff side, some of the pros expected to compete are Carina West of Austria and Daz Parker and Jacqui Slack of the UK.